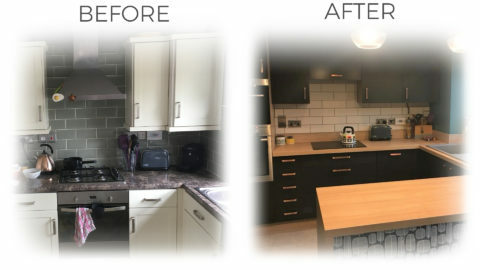 Recently I have blurred the lines between Modern Homes employee and Modern Homes customer by taking the plunge and getting my own kitchen done. It might have something to do with being surrounded by lovely kitchen designs, products and innovations all week long, but I slowly began to detest my old kitchen. The shoddy things I had put up with for the last few years finally became intolerable. Bits of facia were randomly dropping off with no apparent cause or reason. Doors were peeling. Drawers were falling to pieces. It became apparent there were strange space-wasting voids in the cabinetry. We had mysterious lights that never worked – probably because we never found the switches for them. There were things in our corner cupboards that were about as easy to access as the outer reaches of space. The left-hand side of our oven was much hotter than the right meaning that we had to remember to periodically rotate whatever was in there to ensure an even bake. Defrosting the freezer was a hideous mission which took an ice pick and every towel in the house to complete and the cupboard and drawer handles were hell-bent on entrapping me and took every opportunity to catch my cardigan in the most annoying fashion. The list goes on and on. You’d be forgiven for thinking that as I work for a kitchen company the whole decision process would be easier for me. Surely I would know exactly what to go for? Well no, not really. In actual fact, I might go so far as to say it was more difficult. As I am surrounded by displays and samples the combinations of different colours, finishes, styles and designs became mind-boggling. Never before had the phrase ‘there’s too much choice’ been more relevant. I would be sure of a certain combination here at work but after taking a sample home to my own kitchen the colour would seem to change, ruining my whole scheme. Once more I would be back at square one as the knock-on effects of altering just one element meant everything else had to change. Yes, it would be fair to say that my over-thinking got me in a tizz and I found myself procrastinating. I would do things like search for hours online for a kitchen roll holder just to avoid making the big decisions about the kitchen itself. With my fitting date looming I needed to focus. In order to stop the confusion, I had to compartmentalise my decisions. I would recommend this method for anyone struggling with their selections. 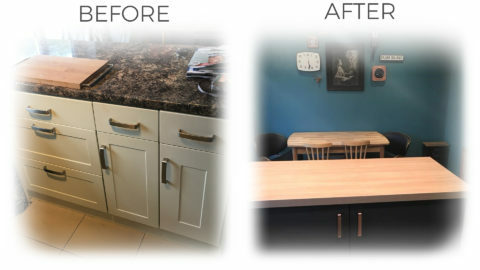 For the style and look of the kitchen, I broke it into 3 elements: Flooring, worktops & door fronts. Until I decided about these 3 elements then smaller things like splashbacks, handles, taps, tiles and even kitchen roll holders, could wait. After much trial and error, it was a joyous moment when I stopped faffing about and nailed down my choices. I found a combination that worked for me by breaking it down into these three vital elements and simplifying the whole process. This is a method that might not work for everyone. 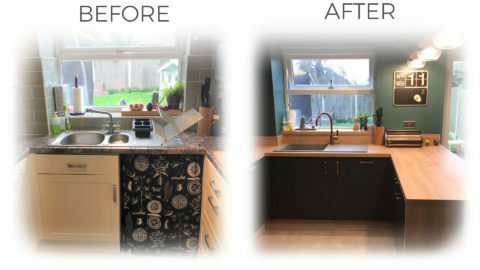 Sometimes the cabinetry needs to actually be in the space before you can even begin to visualise flooring and worktops and sometimes people may just design a whole kitchen around their kitchen roll holder! Choosing a new kitchen should be a pleasant and even fun experience but thinking about every infinitesimal detail all at once can be overwhelming. If you are struggling, remember that we are here to help and can guide you in the right direction. I learned not to sweat the small stuff. Start with the basics and enjoy designing your dream space.